How Do Your Small Caps Really Create Value? Why does an equal-weighted portfolio outperform a capitalization-weighted portfolio over time? 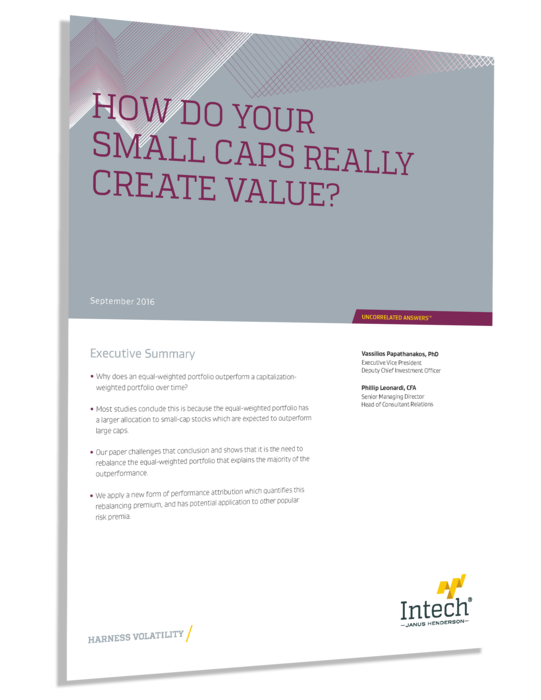 Most studies conclude this is because the equal-weighted portfolio has a larger allocation to small-cap stocks, which are expected to outperform large caps. Our paper, ”How Do Your Small Caps Really Create Value?”, challenges that conclusion and shows that it is the need to rebalance the equal-weighted portfolio that explains the majority of the outperformance. See how we apply a new form of performance attribution, which quantifies this rebalancing premium and has potential application to other popular risk premia.